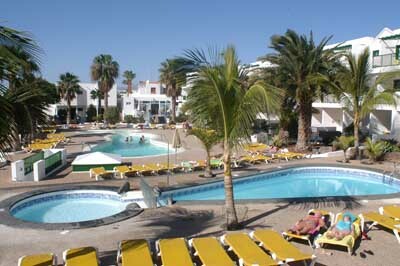 Address: Rociega Nº 46, Puerto del Carmen (Lanzarote), Islas Canarias. This smart and well-equipped apartment complex is well situated in the centre of the popular resort of Puerto del Carmen, a short walk from some of the best beaches on Lanzarote. Spend the day in Acuario Sol, relaxing on the sun loungers with a book, while soaking up the all-year-round Canarian sunshine. Alternatively, after breakfast, you can walk down to Playa Blanca beach – set just 200 metres from the complex. There you can swim in the cool Atlantic waters, or play on the beach with all the family. In the evening, you can return to your spacious apartment to freshen up and take a nap, before heading out for dinner. Apartamentos Acuario Sol is located just a short walk from numerous restaurants and bars positioned on the waterfront. Please inform Apartamentos Acuario Sol in advance of your expected arrival time. You can use the Special Requests box when booking, or contact the property directly with the contact details provided in your confirmation. This property will not accommodate hen, stag or similar parties. Guests are required to show a photo identification and credit card upon check-in. Please note that all Special Requests are subject to availability and additional charges may apply. The name on the credit card used for the booking should correspond to the guest staying at the property. If your reservations was made by a third party, payment has to be made upon check in.